Be sure to use good, country style bread with a tight, coarse crumb and the best ingredient fillers you can find. 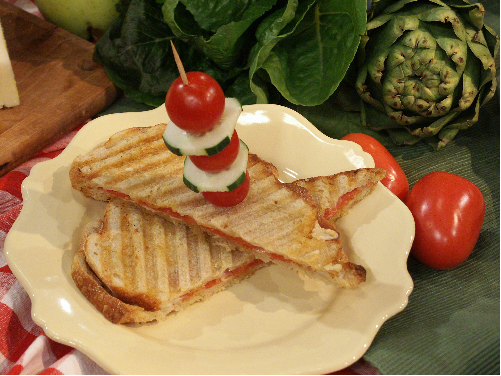 Don’t be piggy and pack too many ingredients in your panini; a thin sandwich is best. It also helps to have a panini maker but if not, use a non stick skillet and be sure to season the pan well with olive oil or butter so the bread will toast evenly and not burn. As the sandwich browns, use a spatula to press on it to help maintain contact with the pan. Granted you will not have designer grill marks on your bread but you will get over it. Here is a sampling of some of my favorites.